Pixie Hill: The truth, a mess and annoying footnotes. The truth, a mess and annoying footnotes. I've blogged about this before, but I think it's worth a revisit since the question still arises fairly frequently. "How do you find the time to do everything?" The simple answer is, I don't. If you broke into my house and had a stroll around you would find: dishes on the counter, piles of laundry in various locations, socks waiting to be paired near the fireplace, a shipping aftermath on 'the good' dining room table (see above), and many more messes dotted around the place. There is dust, spiderwebs and dustbunnies. There are not enough hours in the day for me to accomplish all of the things I'd like to do. I have to make choices. Creating usually takes priority but some days, like today, laundry wins out. I don't do it all, not by a long shot! So long as you're happy with the choices you make and the priorities you set, it's all good. You may remember I said I wanted to do some reading. Upon the recommendation of many (and due to the fact it happened to be sitting unread on my bookshelf) I started Good Omens: The Nice and Accurate Prophecies of Agnes Nutter, Witch by Neil Gaiman and Terry Pratchett. I'm over 200 pages in and I just can't do it. The book sits on my mantle staring at me, the thought of picking it up makes me wince. I want to like it... everybody likes it!... but truthfully I find it terribly annoying. The footnotes do my head in. And so, sadly, I'm calling it a day on Good Omens. *sigh* Book one a total failure. A spot of cleaning, then I'll hunt for a new title. Something completely clear of footnotes would do nicely. We are asked, time and again, how we managed to be able to make a living from our general love of making-of-things. We used to try and give a practical and artful explanation. . . feeling there must be something we could offer that would help others across the board. In truth, after five years, we have boiled it down to exactly what you have written here. . . choices. We placed creating above (almost) everything else. Certainly, from our experience, more than most are willing to do. And we made that choice it every single day. . . even before we managed to sell a single item. Basically, I feel that as adults our worlds are mostly our creation. Everything in it is there because we believe it must be. There ARE a few "have to's" and life definitely tosses the occasional curve our way. . . but, in truth, the have to list is usually self created and far less lengthy than most would agree on. And almost every time we have opened up about our choices, it is met with great skepticism and something like "Oh, I can't see giving up _____ just to make creative time. " And there is the answer. The choice IS made. . . one way or the other. . . every day. We LOVE that you are one who prioritizes creating above so much else and one who accepts that we simply can't do it all. I dont see what the problem is, your house doesn't look that different from mine :) oh wait you have more clean spots than I do..I wont be able to do that until next week. Yup, I have potato chip pieces on the bottom of my socks- oh well...that's life ! Thank you for your truth telling. I have so many messy spots in my home that they are just starting to blend into one big giant messy spot. Today was the first day in quite some time that I concentrated on cleaning inside of the house. I have been sidetracked by yard and garden work/fun, and some minor health annoyances. It seems like the house always waits patiently (though sometimes messily) for me to get to it. Yard and garden work must be done when needed or plants will die, weeds will overtake, etc. I do find myself comparing the way my housekeeping measures up to the images I see posted in blogs. And then I stop and give it some thought and realize that they probably have those messy places in their homes, too. I have to share my craft room with another. I get it in the a.m. and he gets it in the p.m. Therefore, I try to catch up on household things in the p.m. Seems to work well, until I am deeply engrossed in a project - then I infrige on the others time. Oh well. I loved your post, and reading the comments! 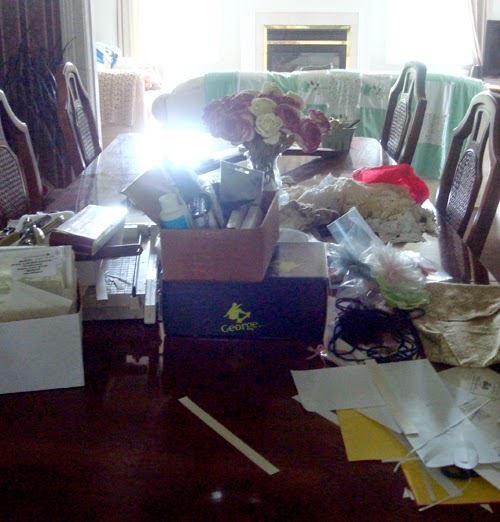 I no longer feel alone in my very messy house, that waits while I create!